Caleb (Domnhall Gleeson) is a young coder working for internet company Bluebook. Caleb wins a competition to join Bluebook’s founder, the reclusive Nathan (Oscar Isaac), at his mountain retreat/research-facility. Nathan reveals that he has created a sophisticated A.I., and that Caleb’s “prize” is to perform a modified Turing test to confirm whether the robot Ava (Alicia Vikander) exhibits true artificial intelligence. Ex Machina is a compelling thriller that uses the ever-more-plausible concept of Artificial Intelligence to explore what it means to be human. This is a rather trite summation of Alex Garland’s directorial debut, and doesn’t do justice to how fresh Ex Machina feels in spite of occupying a well-worn generic furrow. Paradoxically, this sense of freshness seems to stem from the film’s apparent paring down of both the thriller and science fiction to barest genre essentials. 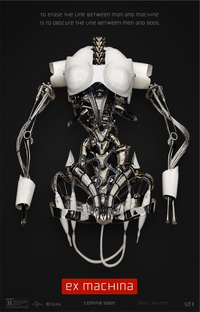 There is nothing superfluous in Ex Machina, it’s lean, ruthless - some might even say mechanical. Ex Machina’s great strength is the skill with which the science fiction and thriller elements are interwoven. These generic strands share a symbiotic relationship, the thriller adding urgency to the philosophic pondering and sci-fi exposition. In turn, the philosophical and psychological concerns of the science fiction plot become the concerns of the thriller; the poles around which mysteries, suspicions, and loyalties are organised. This means that Ex Machina is both a genuinely thrilling thriller and a fulfilling, rigorous piece of hard(er) SF. Ex Machina compares favourably to Transcendence in this respect, a film full of fascinating ideas that singularly fails to fascinate. Ex Machina has been touted as ‘the best British Sci-fi film since Moon’ and whilst I agree that Ex Machina is certainly up there in terms of quality, I feel the comparison is misleading. A much better point of reference would be Jonathan Glazer’s maybe-it-is-maybe-it-isn’t sci-fi Under the Skin. Whilst all three films are concerned with questions of Self when confronted by the Other, both Under the Skin and Ex Machina are primarily concerned with how this plays out in terms of gender. I find Under the Skin to be the more successful in this regard, as Ex Machina all too often slides from being about objectification to just straight up objectifying women. The film’s perspective is also resolutely masculine, with troubling currents of both heterocentrism and Orientalism. The film does address these issues, just not entirely convincingly. Ex Machina plays like a taut chamber piece, with a minimal cast and the action restricted (largely) to a single location. The claustrophobia of the situation is intensified by the acerbic and unpredictable presence of genius software-millionaire Nathan, with Oscar Isaac delivering an incredible performance just the right side of scenery chewing. The film is punctuated by forays into the sublime landscape surrounding Nathan’s lab, although such moments serve to accentuate the sensation of feeling trapped by emphasising character’s isolation, rather than feeling like an escape. Ex Machina echoes cabin-in-the-woods style slashers in this respect, although unlike The Texas Chain Saw Massacre and Evil Dead there is no clear sense of who the monster is. This review was published on January 28, 2015.